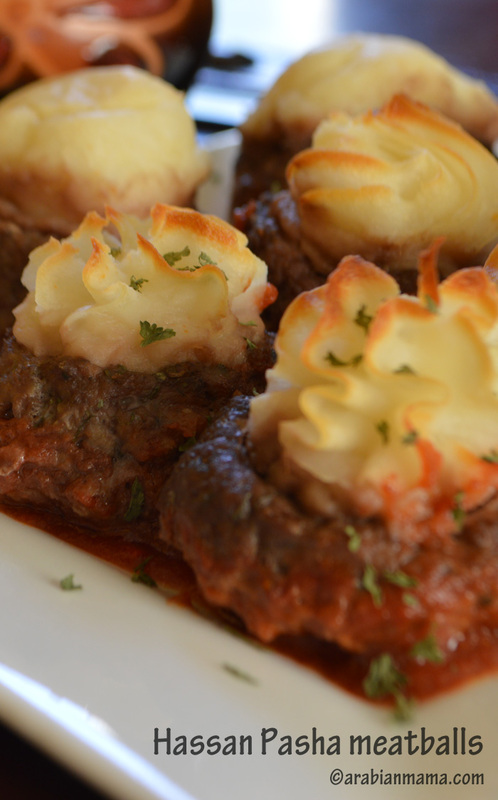 Easy to make meatballs topped with mashed potatoes, presented in a fancy way. 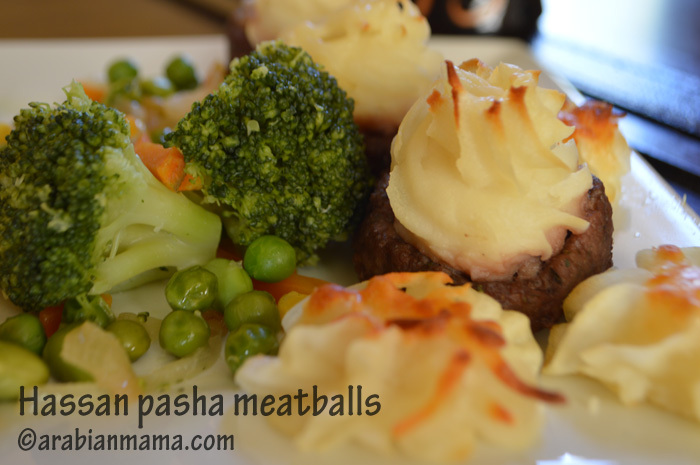 This simple dish can be made with your favorite meatball recipe and you can even use store bought mashed potatoes. Best of all, your guests will think you’ve spent ages to prepare this – not only tasty but lovely looking- dish!! I hope you’ve all enjoyed – and still enjoying the holidays season. It is the time of the year when everything around you turns joyful and pleasant- even if you do not celebrate Christmas – like us- you’ll still feel the joy filling the air!! Ottomans have a large impact on the Arab world- specially the Mediterranean part of the Arab world. Their influence reached not only the culture, language, clothes …. but also in the kitchen. 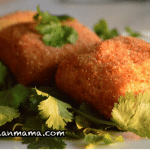 My sons likes this kefta a lot specially my eldest as his name is Hassan. It is believed that this kefta was named after Hasan Pasa – who had a lion pet!!! and whose head looks like this meatballs. This eye appealing dish is easy to make and I always find myself making it with the store bought mashed potatoes :)- just do not tell that I’ve told you that. This dish is very handy when you are trying to feed a crowed for less and above all please everyone from adults to kindergartners. Decorate your plate with the leftover mashed potatoes piped through a fancy tip of a pastry bag and serve with steamed vegetables. 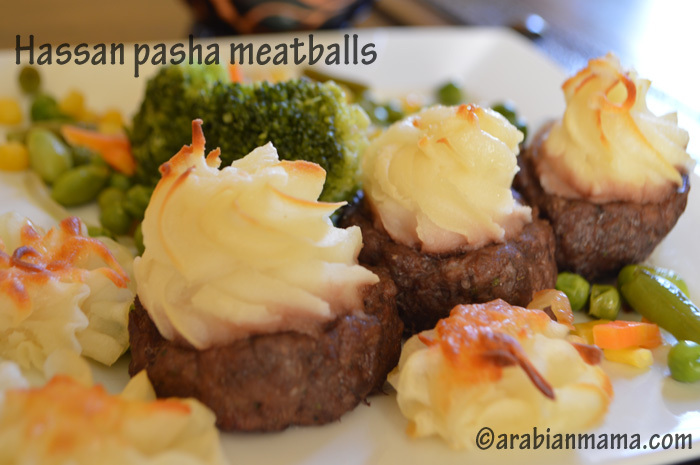 Here is a video on how to make Hassan Pasha meatballs. Stay warm and enjoy your vacation. 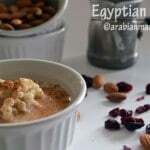 From the Turkish cuisine, comes this easy and lovely looking recipe. 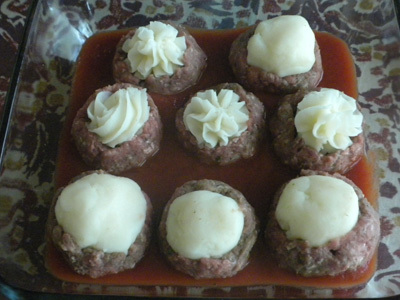 Simply meatballs topped with mashed potatoes. 1 medium yellow onion - minced. 2lbs potatoes boiled and peeled. 3/4 c of milk/heavy cream. Optional: A can of tomato sauce. Mix all the meatballs- kefta- ingredients together. Mash the boiled potatoes and add mil,butter, salt and pepper. Shape meatballs with your fingers and try to form a cup with flat bottom. Spoon the mashed potato on top of the cup. If you would like spoon some sauce in a baking dish. Add the meatball cups to the dish. You can squeeze mashed potatoes using a pastry bag for a more fancy presentation. Place in a pre heated 375F oven for 20 minutes. This is such a great idea! I bet it would be a favorite amongst the kids! Oh, those fancy piped potatoes look so cute but look so easy to do! Happy New Year to you! These are so cool and totally perfect for parties! Happy New Year, all the best! What a great idea – they look like royalty, in little crowns! Perfect for the winter – thanks so much for sharing such an EASY idea – love it! I can see how the kids would enjoy these! I think I would enjoy them too! They look delicious! 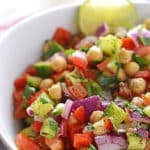 G’day These look soooooooooooooooooooooo delish Amrita!! Wish I could come through the screen and try one now!